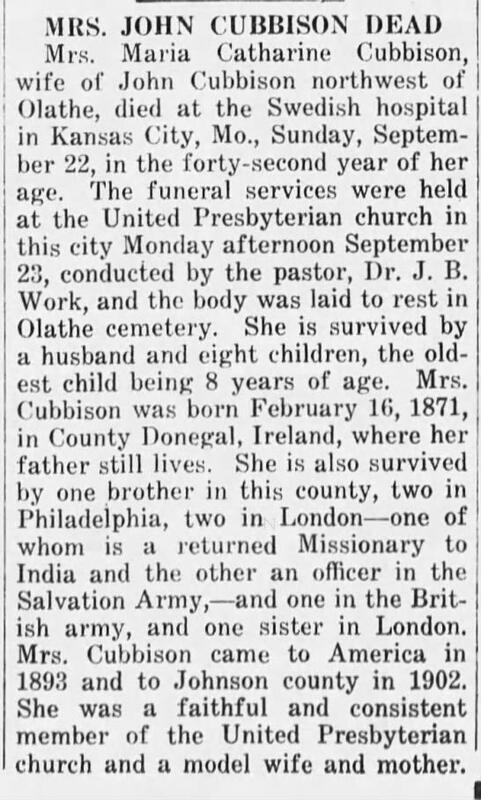 Mrs. Maria Catharine Cubbison, wife of John Cubbison northwest of Olathe, died at the Swedish hospital in Kansas City, Mo., Sunday, September 22, in the forty-second year of her age. The funeral services were held at the United Presbyterian church in this city Monday afternoon September 23, conducted by the pastor, Dr. J. B. Work, and the body was laid to rest in Olathe cemetery. She is survived by a husband and eight children, the oldest child being 8 years of age. 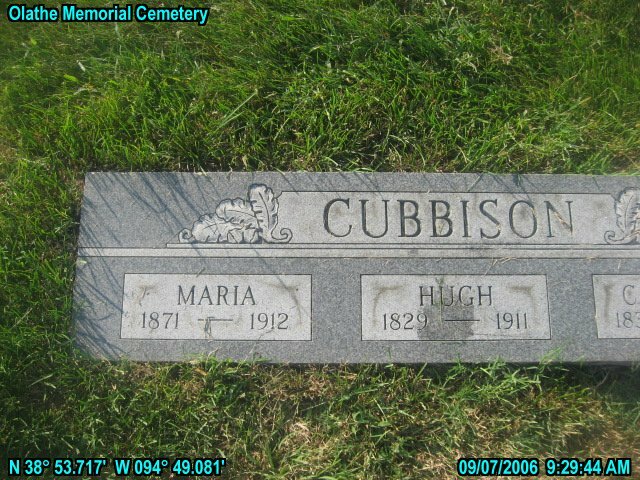 Mrs. Cubbison was born February 16, 1871, in County Donegal, Ireland, where her father still lives. She is also survived by one brother in this county, two in Philadelphia, two in London one of whom is a returned Missionary to India and the other an officer in the Salvation Army, and one in the British army, and one sister in London. Mrs. Cubbison came to America in 1893 and to Johnson county in 1902. She was a faithful and consistent member of the United Presbyterian church and a model wife and mother. Please share your memories of Mary (Maria) C..